This year marks our third year of having Great Ormond Street Hospital Charity as our official charity partner, and already we’re nearing an incredible fundraising total of £300,000. As you’d expect from Butlin’s, the ways we raise money for this amazing cause are many and varied. From climbing mountains and sponsored swims to quiz nights and bake sales, there is nothing we won’t try! Of course, we encourage our guests to support GOSH too, and the most obvious ways of doing so is to make a donation when you book your break, or by putting some change in one of the official collecting tins when you’re out and about on one of our resorts. On October 5, 2015, a law was introduced which meant large businesses (such as Butlin’s) were obliged to charge 5p for anyone requiring a single-use carrier bag, with proceeds from bag sales being donated to charity. Naturally we chose to give ours to GOSH. Now 5p might not sound like much, but across our three resorts we sell a lot of carrier bags. In fact, since October 2015, sales of carrier bags have accounted for more than £20,000 of donations to GOSH. Wow! So next time you’re in any of our shops on resorts, don’t juggle with your purchases – buy a 5p carrier bag and help us grow that incredible total. During 2016, we added a range of pocket-money items – with both Butlin’s and GOSH logos on them – to our range in the Butlin’s Stores, both online and on resort. These include magnets, keyrings, mugs, notepads and pen sets, and every time you purchase any of them, we make a donation of as much as £2.50 to GOSH. 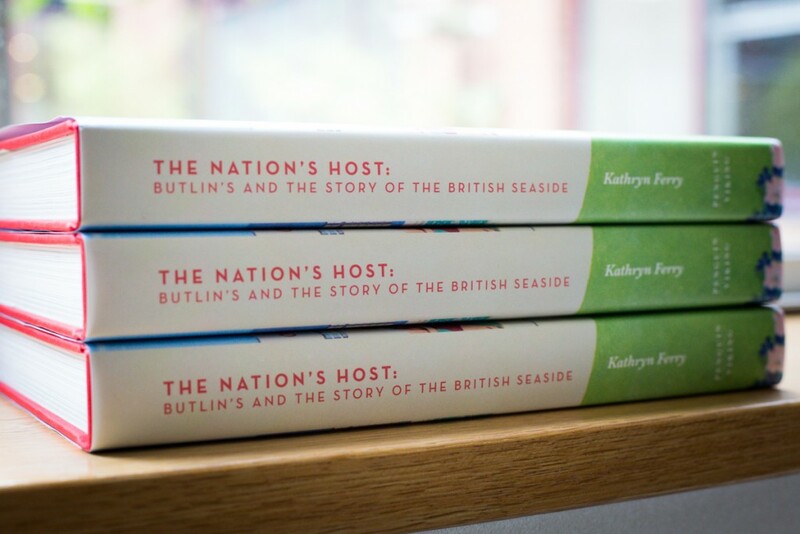 As you probably know, Butlin’s celebrated its 80th birthday last year, and one of the ways we celebrated was to publish a wonderful new book: The Nation’s Host, written by renowned seaside historian Kathryn Ferry. The hardback book tells the official history of Butlin’s and its part in the story of the British seaside in more than 300 pages, including some never-before-seen photographs from the Butlin’s Heritage Collection archives. You can buy the book in any of our resorts or from our online store, and for every book sold by Butlin’s, we will give £5 plus VAT to GOSH. We all like to enjoy a delicious meal when we are on a Butlin’s break – and it’s even better if someone else is doing the cooking and the washing-up! So, we’ve recently launched a new range of set menus at a number of different restaurants across all three of our resorts, and when you order from them, Butlin’s makes a donation of 25p plus VAT to GOSH. The amount it can and will add up to will make an incredible difference. The Diner at Bognor Regis and Minehead, Sun and Moon at Minehead, The Beachcomber Inn at Bognor Regis and Skegness, Firehouse at Skegness, and Ludo’s at Skegness. So next time you’re grabbing a bite in any of these restaurants, be sure to check out our new set menus. The next addition to our range of additional fundraising opportunities for GOSH are Tote bags, which are due to be available to purchase on resort from Easter. What makes these bags special? Well apart from the fact that Butlin’s will donate £1.50 from each one, the bags will be designed by patients from Great Ormond Street Hospital! So, next time you are on resort, remember there are lots of ways to make a valuable donation to a great cause without breaking the bank. On behalf of everyone at Butlin’s and GOSH, thank you for your generosity.